Description: Larvae: Tadpole-like but with frills around the neck through which it breaths underwater. Tail is flattened and the body is tan-brown overall. 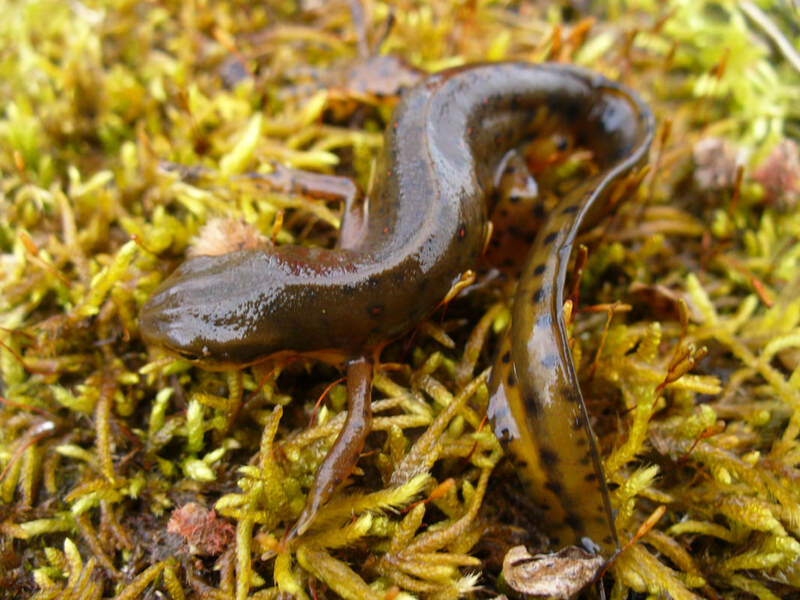 The eft, or land phase of the newt, is the most commonly encountered stage in the species life cycle. They are reddish orange with black margined orange spots on the back and smaller black speckles on the sides and undersides. 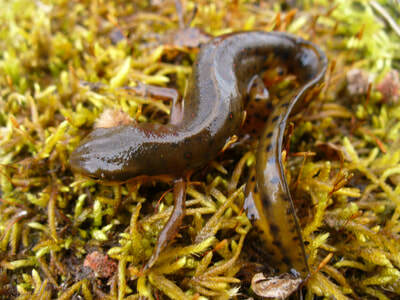 The efts are dry skinned, unlike most salamanders which have moist skin like a frog. Adult: Returns to the water, developing a flattened tail used to paddle in swimming. They become olive green with a yellow green underside and spots all over their body. The red dots remain on the back. Eggs: ​Laid in clumps in ponds, marshes and beaver wetlands that they inhabit. Leeches, as with many amphibian eggs, can be a serious threat to developing young, eating the embryo's out of the jelly-like casing that protects them. Habitat: Wetlands such as beaver ponds and marshes for adults and larvae. The eft stage is terrestrial, emerging from the water and living on land. 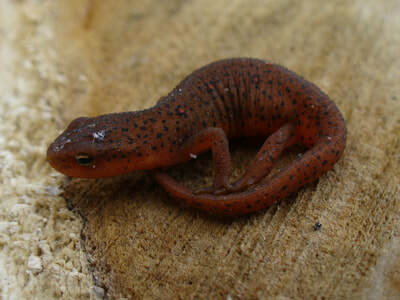 They inhabit the same places any normal salamander does; moist leaf litter, beneath stones, boards, flat rocks and logs. 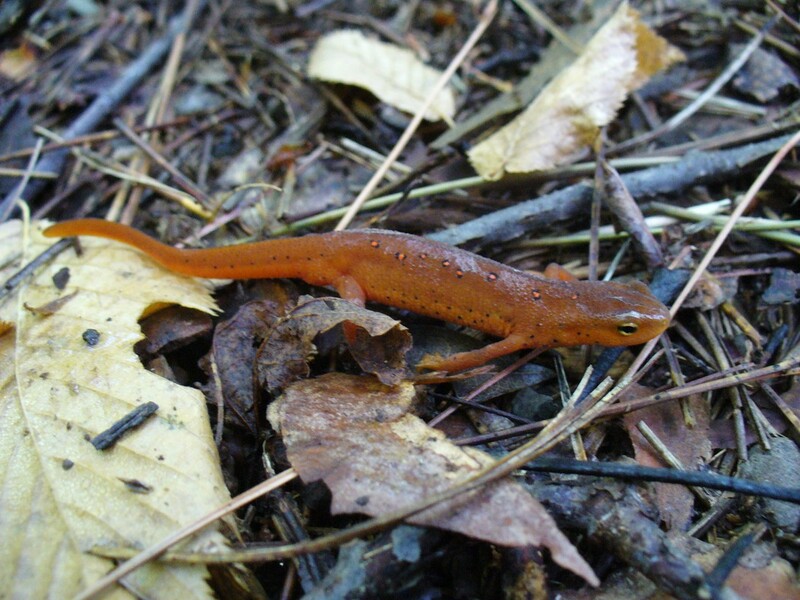 On rainy nights, newts cross the forest floor and roadways. They are often easy to find the next morning when they are still actively moving about. Try searching on the road if it is still wet from the previous night's rain. Adults need air to breath and can be seen coming to the surface to get air or moving about underwater. Diet: The land stage of Eastern newts feed on small arthropods such as earthworms and small insects, found in the leaf litter and under the cover they hide beneath. Larvae feed on vegetation and small aquatic invertebrates. Adult newts are carnivores feeding on small insects underwater, sometimes plucking an insect from the surface of the water. Defenses: The Eastern newt boasts bright coloration that is indicative of its toxicity. Efts especially have toxins in their skin that can be irritating to predators or people handling them. 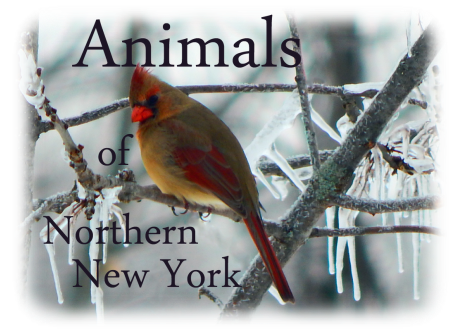 As a general precaution, wash your hands after handling one of these creatures, or any wild animal. Children often play with newts and may be more likely to put their hand in their mouth or eye area where the toxins can be irritating but are still mostly harmless.